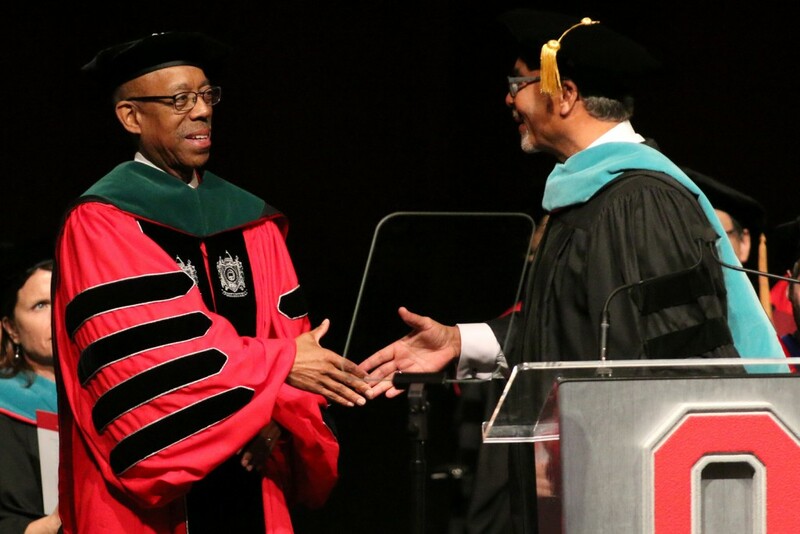 Standing in front of a large sculpture of the Ohio State seal and a backdrop of scarlet and gray drapes, President Michael Drake took his oath of office in a ceremonial installation of his presidency at Mershon Auditorium on Tuesday. In his “investiture address,” he spoke about how his past shaped his character and the future he envisions for OSU, instilling his stories with the administration’s common themes of access, affordability and excellence. In the marquee topic of his speech, Drake announced a five-year, $400 million plan that would redirect funds toward academics and need-based scholarships. 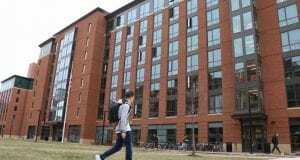 OSU plans to reallocate $200 million of that through administrative cost-cutting measures, with the other $200 million coming from new revenue generation, such as the privatization of university parking or contracts with companies like Huntington Bank and Coca-Cola. 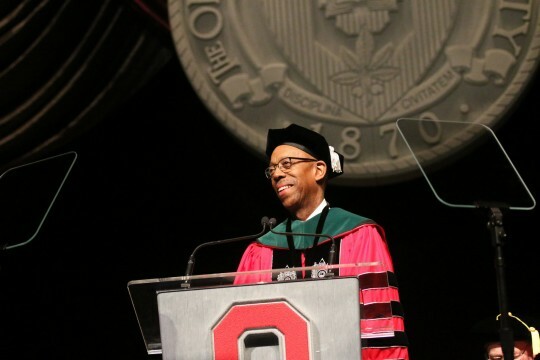 As a model for spending cuts, he cited recent cost avoidance, reduction of color printing, and human resources changes at the Wexner Medical Center that have saved the university $50 million over the last nine months. The president also announced plans to reassess administrative salaries to free up costs. Executive Vice President and Provost Steinmetz told The Lantern last week that while current employees would not not necessarily be immune to new guidelines, no changes would be made to standing contracts. Aside from the $400 million initiative, Drake largely used his speech to address three themes the university needs to stress in the 21st century: its land-grant mission, community engagement and diversity. Drake said his administration is working toward greater coordination of its diversity program, which has so far entailed the realignment of the Office for Diversity and Inclusion with the Kirwan Institute for the Study of Race and Ethnicity. He also plans to implement diversity training for faculty search committees and to assign a committee to observe and evaluate diversity issues on campus. 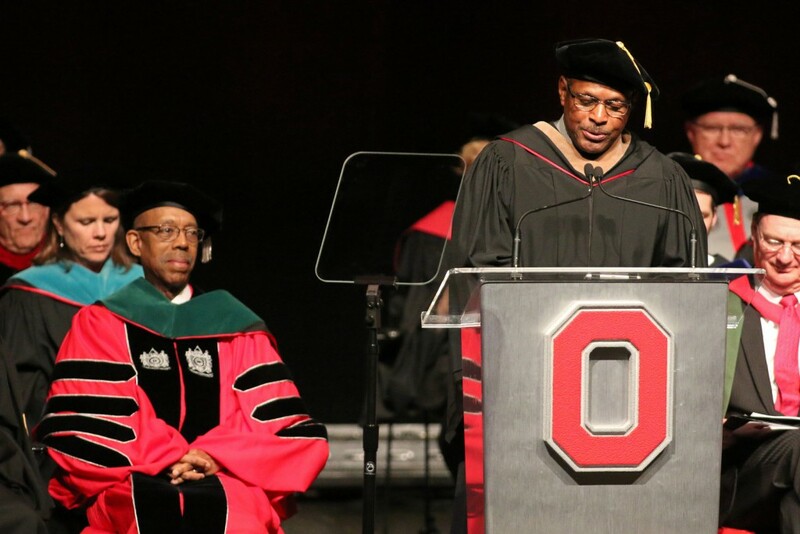 Drake, OSU’s first black president, noted recent “racial and other forms of discord and intolerance across our country,” which he described as deeply troubling. 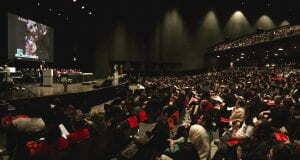 “Our universities — of all places — must welcome and celebrate all individuals, regardless of race, class, culture, orientation or identity,” he said, triggering a thunderous applause. 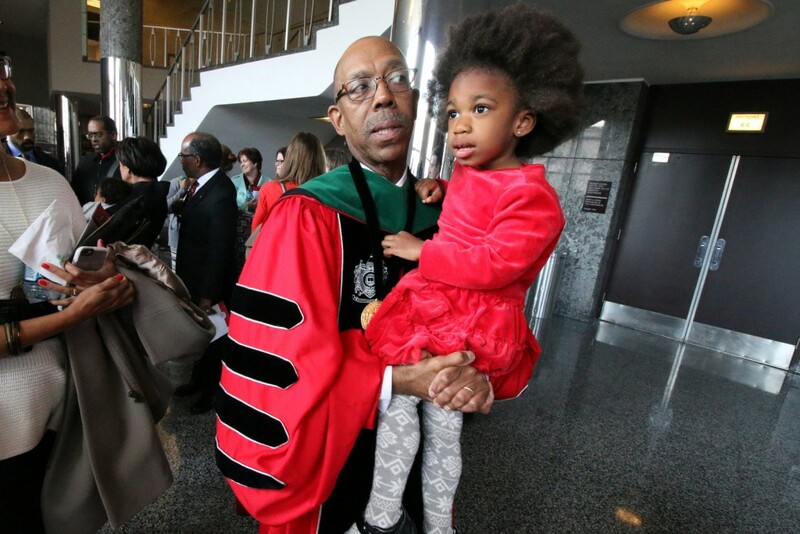 On the issue of community engagement, Drake said the university’s Discovery Themes are a stepping stone for the its academics to address social needs. Launched in 2012, the Discovery Themes target health and wellness, energy and environment, and food production and food security. The $400 million plan includes expanding research and hiring new faculty. The president spoke of a $15 million investment to hire faculty to address food insecurity. Within the next decade, the university will commit nearly $100 million toward food insecurity, he said. 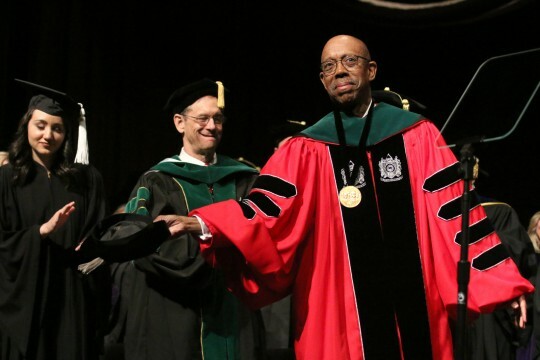 “Our collective efforts can, and will, transform lives,” he said. Drake also addressed an issue that has recently grabbed the attention of OSU professors: a proposal in University Senate that would broaden the ownership rights of the university on faculty intellectual property. 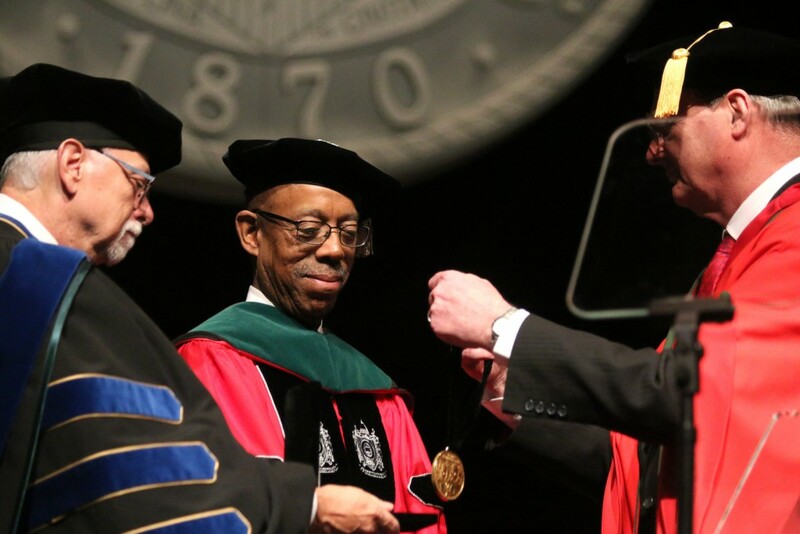 “This gives me an opportunity to reaffirm our belief in the bedrock principle that the traditional scholarly and artistic intellectual endeavors produced by our faculty belong to our faculty,” Drake said to the first and loudest applause of his speech. Along with the the football team, Drake praised the university’s recent varsity teams that have won national championships, including pistol, wrestling and synchronized swimming. “I guess with those three champions, you shouldn’t mess with us on land or on sea,” he said. 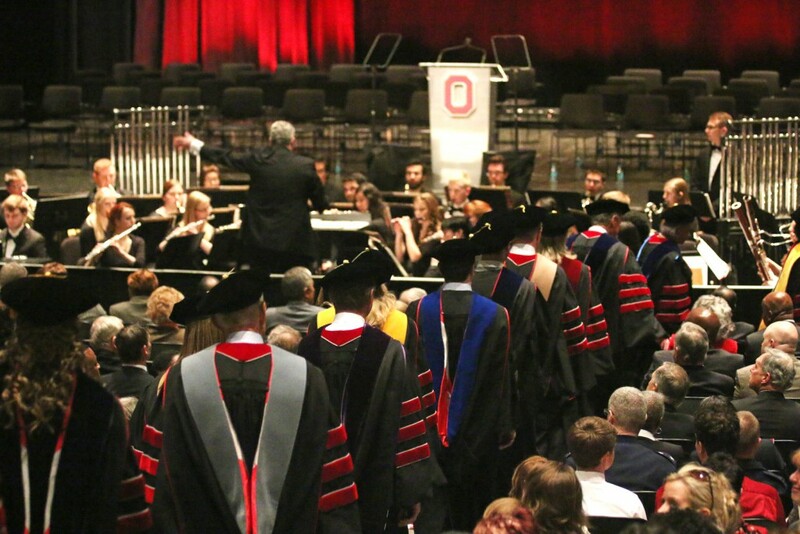 The investiture kicked off with a prelude from the OSU Wind Symphony, which later performed an overture that School of Music professor Tom Wells wrote for the event. The symphony continued to play during the processional as trustees, senior administrators and community figures walked down the aisles of Mershon Auditorium and onto the stage, donning academic regalia. 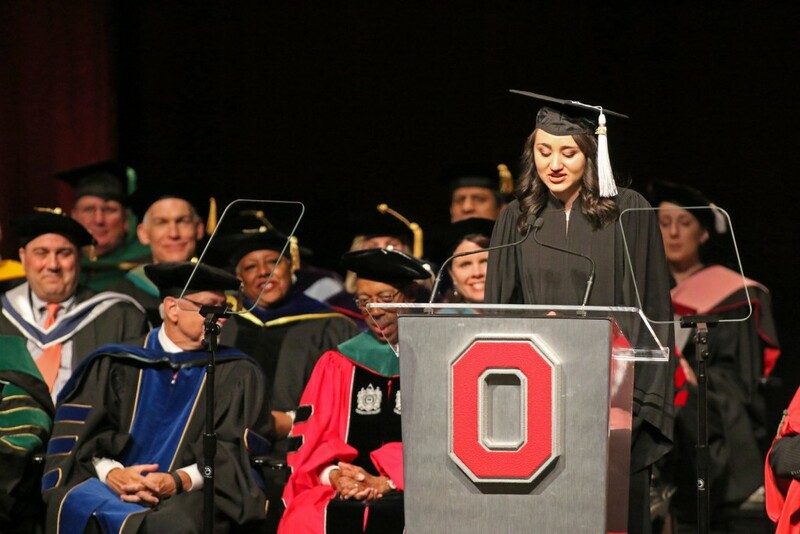 Organized by a 14-member committee of faculty, staff and students appointed by the OSU Board of Trustees, the investiture had an audience of thousands of faculty, staff, students and members of the community, all of whom received elaborately-designed invitations and tickets. 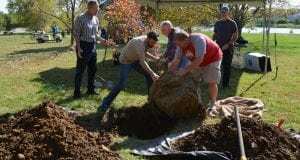 Attendees included John Glenn, former OSU interim president Joseph Alutto, and dozens of university representatives and politicians from across the country. Traveling guests were granted discounted accommodations from the university, which reserved room blocks at three hotels: The Blackwell Inn; Le Méridien Columbus, The Joseph; and Hilton Garden Inn. The university also covered the costs of airport and campus area shuttles for attendees. 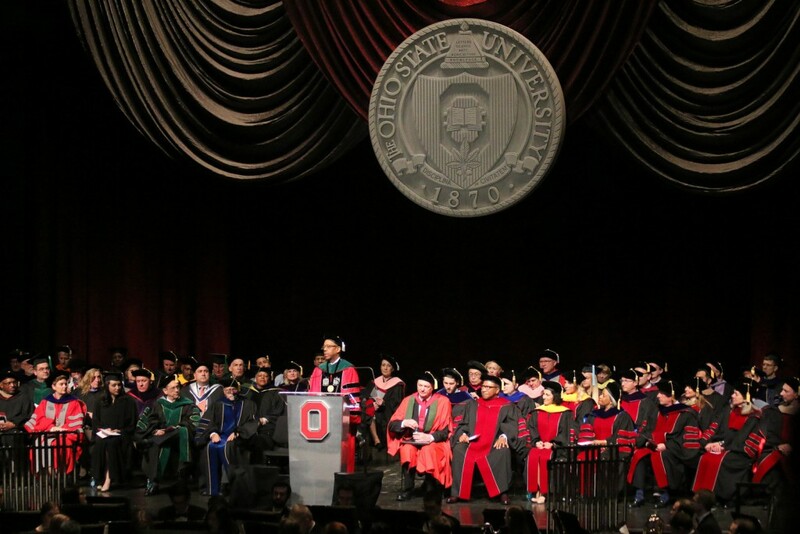 Unrestricted funds, meaning no tuition or tax dollars, were used to cover costs associated with the investiture, said OSU spokesman Chris Davey. Total cost figures are in the process of being finalized. Timothy Gerber, secretary of the University Senate, went on to tell Drake’s story in his welcome speech, describing the new president as warm, quick-witted and compassionate. He dove into Drake’s roles as an academic, family man and, what Gerber said was most influential on Drake’s character, a physician. Coleman spoke of OSU and Columbus with pride, and highlighted Drake’s importance for the success of both. For President Drake’s full speech, watch the video below. (insert angry comment from a OSU band alumni (1972 or earlier) who cant see past blind loyalty and hangs a carrot of never donating their $100 yearly donation to OSU. 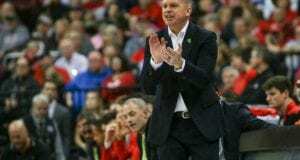 Ramble, ramble, ramble,) Go Buckeyes! You paid Drake/Wadsworth/Steinmetz goons are something else. Now you are down to posting epithets about OSU band alumni who have been deeply insulted and you poke fun, make jokes and demean their dedicated contributions. Shame on you. Have you never read the story of the widow’s mite? Perhaps you should take some humility lessons. You need some. Your astroturfing is so obvious. Drake’s cronies can hire all the goons like you they want to try and shout down his detractors, which grow daily, but he still must come clean on his personal financial holdings. He’s hiding something. Your cynical OSU band comment proves you are not a Buckeye and have no clue about what you are choosing to criticize. Your handlers should have at least given you a little background before sticking you in your astorturfing cubicle. How much is Drake paying you to post your pointless drivel? He can’t get fired soon enough for me and my friends. His words today dripped with insincerity. I will be working diligently until he is fired and gone. He should have never come. The age of the crime boss has officially arrived. How will OSU be a beacon by putting hundreds of their own middle class staff out of work and partnering with rapacious corporations to offer scholarships to low income students while maintaining unaffordable tuition levels for everyone else? Maybe we could have started on that $200 million administrative cost savings by NOT wasting the funds spent on this Investiture? What a waste of university funds for a bunch of pomp and circumstance. More like a dog and pony show . . .
Can someone please explain to my why everyone hates Drake so much? Taylor, Paul, alum you are right on the money! I do not like this president’s modus operandi. Dear Student, Drake is a tool for a cartel of companies working to capture your course, graduate and research work and siphon it off to his cronies in Silicon Valley/Stanford “big data” where Drake cut his teeth and maintains his well-ensconced connections. Then, you can join the under-compensated “middle class” who can never seem to get ahead because your best ideas are secretly fed to and funded by this cartel. His words are George Orwell 1984 double-speak lies. “Diversity” = hire more of Drake’s friends. “Engagement” = learn who your friends, networks and associations are so his cronies can outrun all of your best business ideas. Follow the money. But wait, Drake has withheld disclosure of his personal financial holdings in violation of Ohio ethics disclosure laws. Imagine that. The only consolation we have is that almost every university in the country is this bad in terms of administrators’ greed, and faculties’ desire to remake the university to match their personal views. Scholarships for the poor? They can take out loans like the rest of us! Please use that $400 million to drive down tuition for all!!!! This guy is such a weasel. He is not and will never be a Buckeye and the day he is gone can’t come soon enough. I have never met, nor known, nor known of, anyone with such an inflated self-image who ever succeeded at anything worthwhile…. Best of Luck OSU. Drake was and is extremely underqualified for the postion and was brought in here as a puppet stooge for the board of trustees. 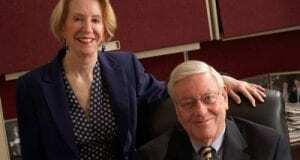 Gordon Gee was a super qualified educator, leader and fundraiser but the board could not control him. Drakes’ fiasco three weeks upon his arrival regarding the OSU band and wonderful director is not going to go away. Drake is now on an extremely short leash, he has no public speaking skills or charisma and when the fundraising numbers come in pathetic for 2015; the board will retire the Drakester real quick. If Drake is so interested in community engagement, why is it easier to find a UM fan on campus than our dear president? Here’s an easy way to save administrative costs: all salaries/bonuses for VPs and a level below are automatically set to $150,000/year or less. Also, Gee was just as bad, if not worse, than Drake, and at 3x the cost. When talking about Drake, the Jon Waters firing MUST be mentioned because Drake made a personnel gaffe in the opening days of his LAST position as the president of UCI. What that should tell you is that he doesn’t learn from his mistakes and isn’t wise enough as a leader to question the motives of the first person to lay a scathing report on your desk the minute you arrive on the job. He’s just a medical doctor in over his head. Forget the band alumni, it wasn’t a couple hundred TBDBITL alumni who booed him at the football teams national championship celebration it was a broad sampling of fans and students who recognize that Drake isn’t a good fit for Ohio State. This university needs LEADERSHIP, not dark-ally business deals, press interviews and social media releases made from inside some dark mahogany furnished office. He’s a foreigner here who doesn’t know what makes our hearts beat. He doesn’t know where our pride comes from. He doesn’t understand how a university this size can feel like a family. The danger is that his policy and his progressive agenda will destroy those things. . .and it didn’t taken him long to begin. . .with the Waters’ firing.